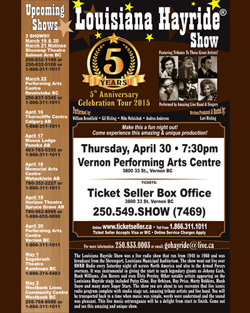 Join the Louisiana Hayride gang as they celebrate their 5th Anniversary of bringing this incredible show to audiences across Western Canada. The Louisiana Hayride was a radio show that began in 1948, broadcast from the Shreveport, Louisiana Municipal Auditorium. The show had a studio audience of over 3000 and also went out live over KWKH Radio every Saturday night. It is famous for giving the start to such legendary giants as Johnny Cash, Hank Williams, Jim Reeves and even Elvis Presley. Other notable artists appearing on the Louisiana Hayride stage included Patsy Cline, Roy Orbison, Ray Price, Marty Robbins, Hank Snow and many more Super Stars. The show you are about to see recreates that live iconic radio program complete with studio stage set, amazing tribute artists and live band. You will be transported back to a time when music was simple, words were understood and the sound was pleasant. This live music extravaganza will be a delight from start to finish. You will love this amazing and unique show. You will LOVE the songs, You will LOVE the stories.